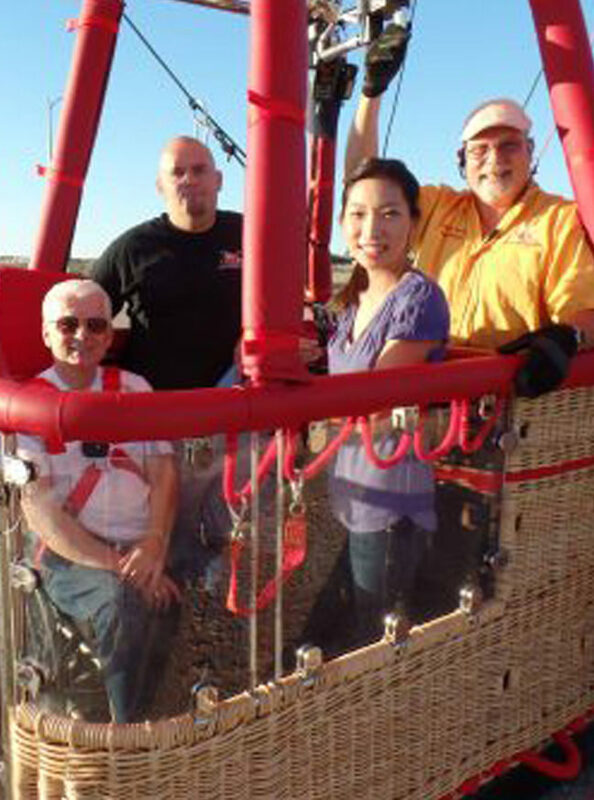 In Nevada’s only wheelchair accessible hot air balloon, you can fly too. The wheelchair passenger and up to 3 guests (depending on size and time of year) can enjoy the beauty and splendor of hot air balloon flight. Roll on in your own wheel chair via our easy access ramp to have both you and your chair secured with DOT certified bracketing. Lift off and float over the Las Vegas valley. Enjoy the freedom of flight. Drink in the beauty of the Red Rock State Park, look down on the Strip or fly over the mountains all through our eye-level polycarbonate windows on two sides. After landing enjoy your traditional post flight celebration with light refreshments and mementos while your professional flight crew packs and stores the balloon for it’s next adventure. You will remember for a lifetime your hot air balloon flight. Only $695 for the wheel-chaired person and one caregiver. Each additional passenger is only $199 each. Maximum 3 guests. Call (702) 726-0400 to discuss the possibility of flying in our custom hot air balloon.